The new Sizzix dies started shipping this week so I thought I would make a card using the new Pumpkin Parts Bigz die. Super cute and great for fall! I cut the pumpkins parts from Grungepaper. You'll notice the pumpkin is scored when run through the Vagabond machine. This makes it super easy to see right where the parts go when putting the pumpkin together. I painted the pieces with Ripe Persimmon and Peeled Paint Distress Paint. Once the Distress Paint was dry I gave the main pumpkin a coat of Distress Crackle Paint then set it aside to dry. About an hour later, I came back and the crackle had done it's job. I pounced Frayed Burlap Distress Stain over the entire pumpkin so the stain would seep into the cracks, then wiped away the excess. Love the effect its gives! I coated each of the remaining pumpkin parts with a thin layer of Glossy Accents. Then poured Spiced Marmalade Distress Glitter over each piece. 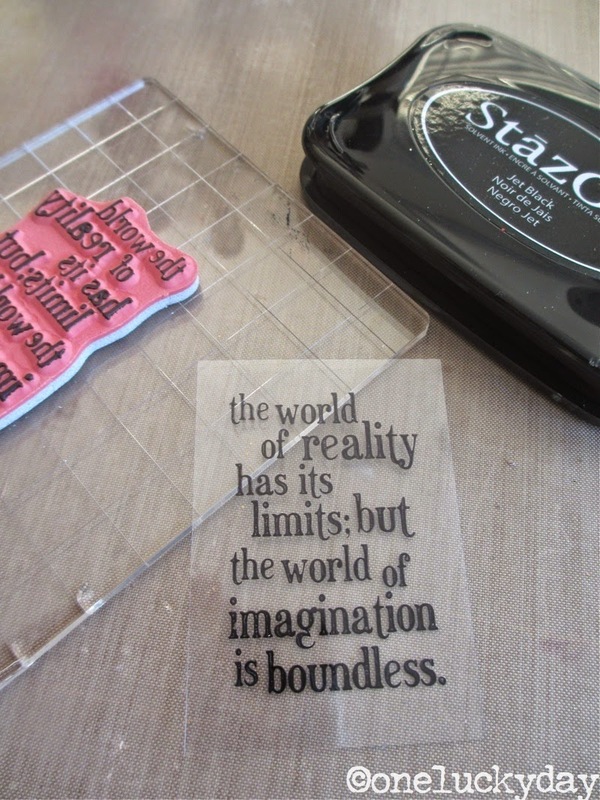 Tap off the excess glitter and leave to dry on your craft sheet. Do do not press the glitter down. 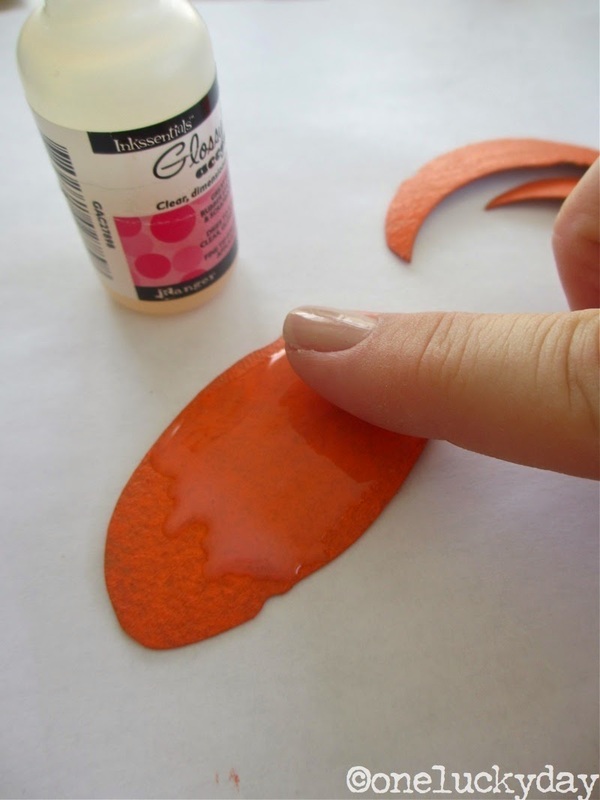 Once dry, you can use Distress Ink to color the edges of the glittered piece. I cut a card base from Core'dinations Kraft Core cardstock in a dark green as well as a card front from the 6 x 6" section of the Wallflower Paper Stash. I used a Tonic Paper Distresser to rough up the edges of the patterned paper, then inked it with Vintage Photo. A quick stitch around the card front with dark brown thread. Once the card base was complete, I used the Burlap Layering Stencil and Ranger Texture Paste to add texture to the card front. Just a couple notes on the new Texture Paste - it's very light and easy to spread. It also dries really quickly with the Ranger Heat Tool. Super happy about that! And two minutes later, it's dry and ready to ink. 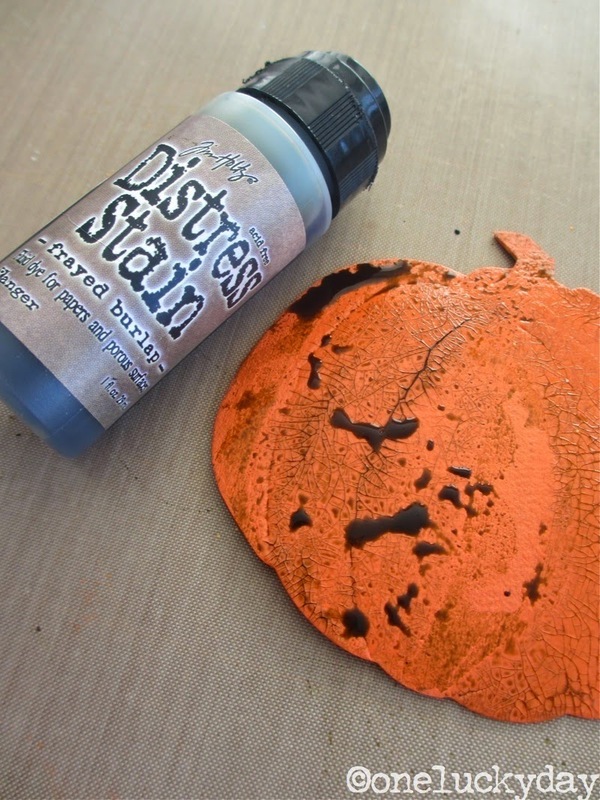 I chose three colors of Distress Ink I thought would complement the orange pumpkin; mustard seed, wild honey and seedless preserves. 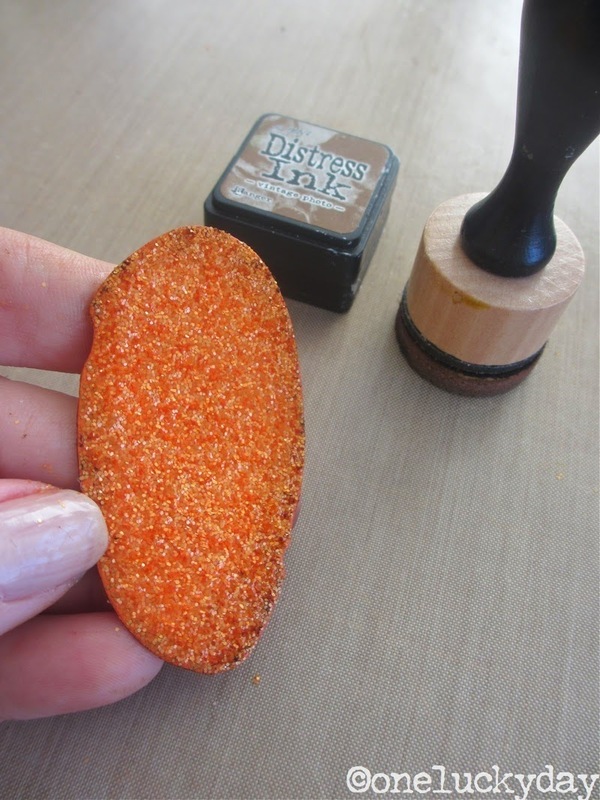 The Distress Ink and the Mini Blending Tool work like a charm over the Texture Paste. I love that the Texture Paste is totally inkable! The pumpkin is large so I needed a small quote. Yes, I could have just stamped the card front, but I decided I wanted to stamp on a transparency with Stazon Ink and add it to the card front with a Tiny Attacher. I did add a bit of Antique Linen Distress Paint onto the card front to obscure some of the flowers and writing so the quote transparency would stand out. I added the pumpkin and a few Mirrored Stars to the card front. I decided to add some small leaves at the stem of the pumpkin. This was easy using the same color cardstock as the card base and the Autumn Gatherings Decorative Strip. A little sanding and bending and there you have it. The Kraft Core cardstock is easy to work with, one quick sanding and you have a great distressed look. I added the leaves to the stem with Multi Medium making the pumpkin complete. I also added a bit of Jute String to the folded edge to complete the card. Love how this big sparkly pumpkin turned out! The Distress Glitter was the perfect medium make it shine. Note: I used a Walnut Stain Distress Marker along the left side of the "faux creases" in the pumpkin, then smeared it with a bit of Multi Medium, giving the pumpkin more depth. I hope you will check out the new dies that were released this week....you know you can count on me to be back with more ideas! yes, I do. Sometimes I have forgotten that simple step and I'm always disappointed. Today worked out well. I love Fall & Halloween so this die is already on my "wish list"! Love this beautiful card! Great idea to just glitter some of the pumpkin sections. 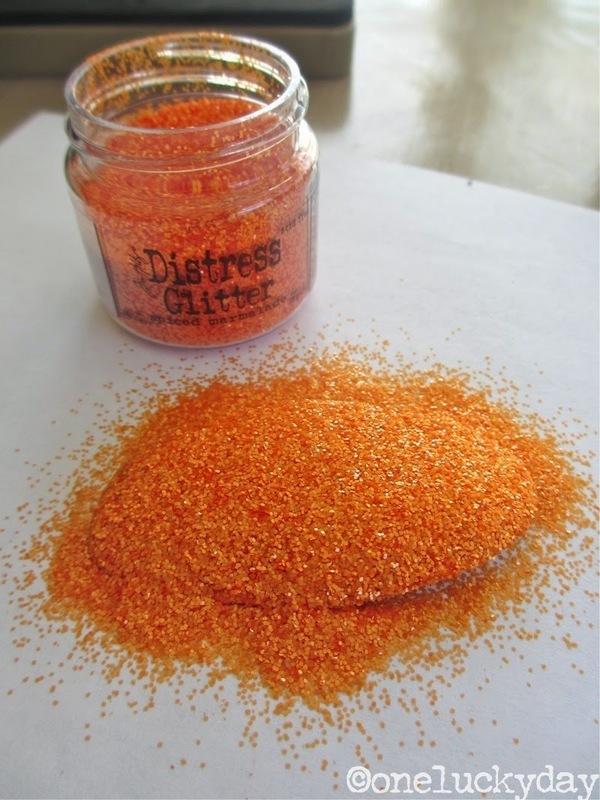 I have some of that glitter and it is a gorgeous orange! I will be starting my Halloween cards soon and you've given me some great ideas! Thank you! Your card is smashing! Love this pumpkin card and I love that it isn't necessarily Halloween! Great card Paula! I'm looking forward to getting the new dies! Just lovely Paula! 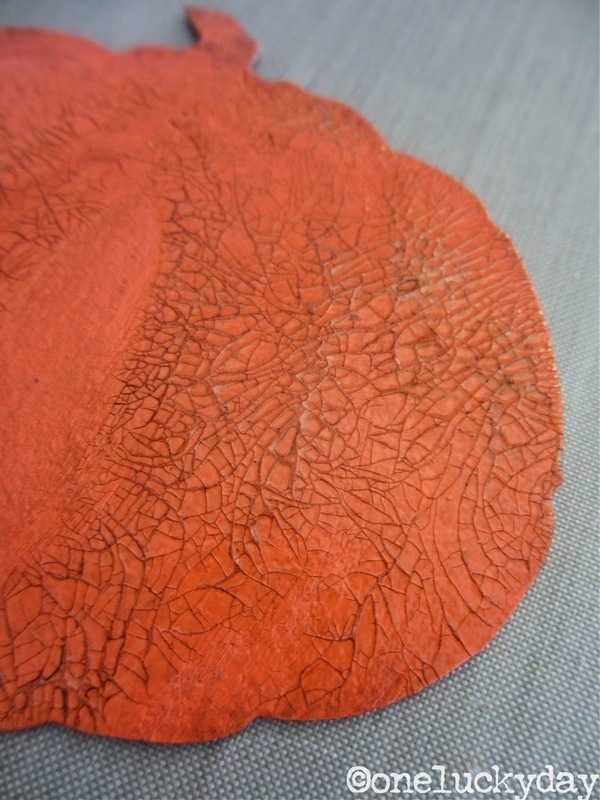 The texture and layers with the crackle, texture paste and glitter really brings it to life. Love how the placement of the pumpkin has some of the flowers peeking out from the wallflower background. Thanks for sharing! Love the pumpkin card, Paula! Love your tutorial, too. The wallflower paper is so versatile. 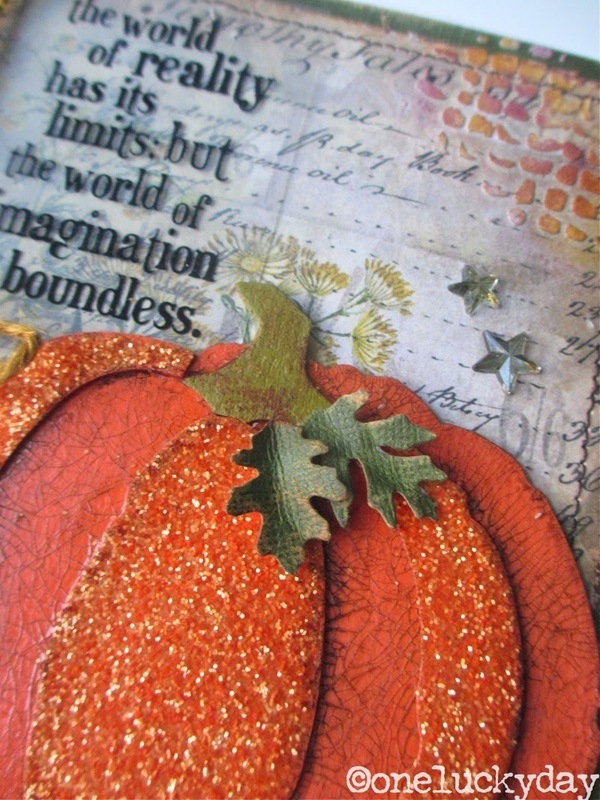 It works well for Fall cards and is a wonderful background for that gorgeous pumpkin. TFS! thanks Laura! You are always so nice about my simple projects. Hopefully I'll see you in TX in Oct.
such fabulous techniques!!! thank you for sharing your inspiration...awesome card!! thanks Chelle! Loved your ice cream card! Great card!! Love the crackle on the pumpkin and the addition of the stencilling balances everything out so well. Great idea to add the little oak leaves to the top of the pumpkin too! I really did not think I needed the pumpkin die ..... Until now that is! I love the way you used the glitter on the pumpkin, it really makes it 'pop'. Oh wow.... amazing card and love that die. Wish we celebrated pumpkin time here :) stunning Paula. Beautiful card, Miss Paula! The pumpkin die is on my want list. Can't believe you couldn't find a place for Iced Spruce though! Fabulous card! Love all the techniques. Thanks for the great tutorial on how you created this, Paula. I love that distress glitter! I love Fall and this pumpkin card is a great incentive to start some Fall projects. Thanks for sharing Paula. Paula, Thanks for the very helpful tutorial. I don't have the pumpkin die but the techniques for the products will be very helpful. And you gave me another use for my Wallpaper stash. Wowza! Perfect combination of details - great card! Love this card! That is one of the new dies on my wish list!! Just beautiful... the techniques you use are just awesome... that crackle paint on the pumpkin with frayed burlap ... WOW, THEN the paste WOOOOOOOOOOOOO ... you rock Paula ! Wow, love it to bits...great job Paula thanks for sharing love all the new releases! Just pumpkinlicious, Paula!! I didn't think a pumpkin could have possibilities!! 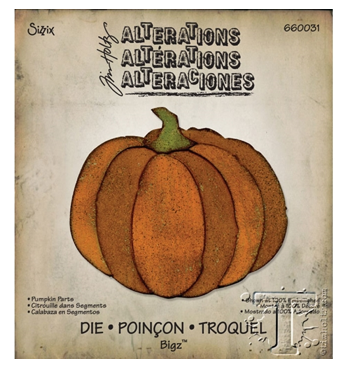 That new TH/Sizzix die is wonderful and you've turned that pumpkin into a work of Art!! This is such a lovely card :) Awesome as always, Paula :) XOXO-Shari T.
Fantastic, love the pumpkin and the texture paste with those colours. Oh my goodness!!! This pumpkin rocks! LOVE LOVE LOVE this! The whole card is fabulous! Your card turned out awesome! I love all of the details in the pumpkin. I must get this stamp! 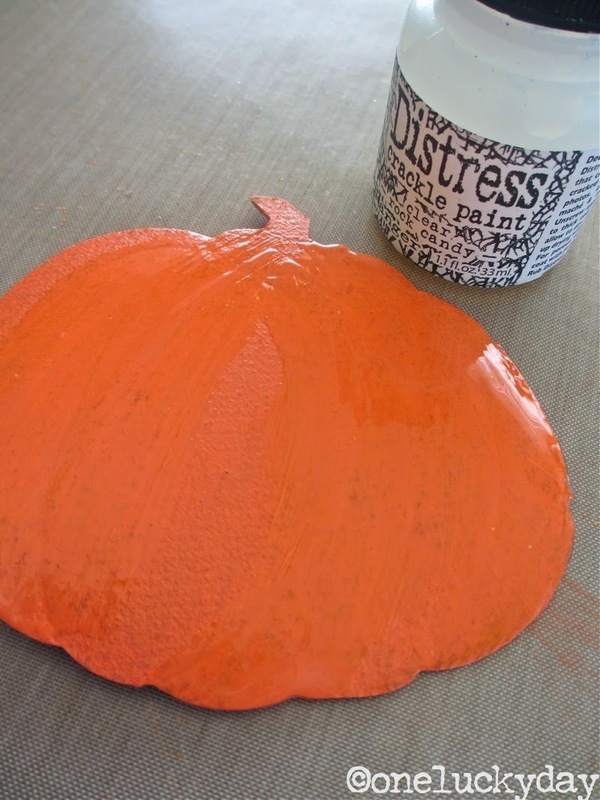 The pumpkin looks fab, and I'm loving the colored paste... so pretty! I love your card. The pumpkin is gorgeous. I'm was hooked with all the creativity applied to the Wall flower paper! It's so pretty as is, but I love the height you took it to! Stunning card!!! So going to get the leaf and the pumpkin die. Yep you just put them on my want list! !